Pangolins are protected under national and international law, but their scales are apparently highly-valued in some Asian countries, for decorative as well as alleged medicinal properties. A Pangolin. 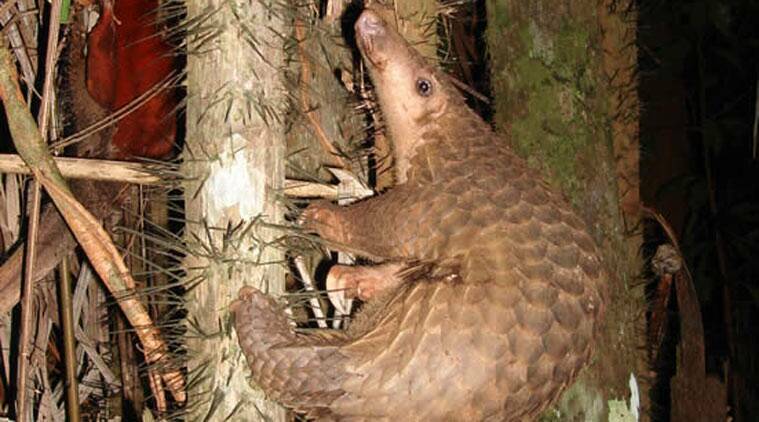 (Source: Wikipedia) It is a tale of maybe’s and whodunit’s, how more than a third of all pangolin scales seized in Mizoram have disappeared and possibly re-appeared (only for some portion to perhaps disappear again) in another seizure more than 350 kms away. It began in the end of May this year when it was discovered that 292 kgs of seized pangolin scales locked up in a forest department godown in Kolasib, a western town, had been replaced by fakes. The consignment made up more than a third of the 848 kgs of pangolin scales various law enforcement agencies had caught from smugglers since 2012. Consignments have been seized in some North-Eastern states, all supposedly headed towards South-East Asia through Myanmar. A case was registered soon after the end-May incident at Kolasib, but initial investigations apparently went nowhere. Then, two-and-a-half weeks later on June 11, a joint operation by police and the Assam Rifles seized six bags from a bus at Farkawn, a village close to the international border with Myanmar, at six in the evening. The bags contained 216 kgs of pangolin scales, the police and AR told the forest department when they handed it over the following day at two in the afternoon. The official account from the forest department says the AR troops had opened the bags and took pictures with the seized pangolin scales and then re-packed them for submission to the forest officials. But when the forest department officials received and weighed the bags, they found it was 32.5 kgs lighter. As of now, they remain clueless how this could have been — either some amount went missing during the 20 hours between the seizure and the handing over of the consignment to the forest department, or the police and AR had incorrectly weighed the goods. What has added more mystery to the siezure was that the bus driver testified the cargo was loaded onto the bus by one Hmangaihthangi of Kawlkulh village, more than 164 kms north-west of Farkawn. Hmangaihthangi went to Farkawn after being told that the cargo had been seized because it contained unlawful materials, but when she was interrogated, she said she had indeed loaded it onto the bus but that it was someone else’s. The owner, she said, was a Myanmarese trader she knew only as Paliana, which could either be a name or the person’s build because Palian in Mizo translates to Big Man. She knew Paliana from before and she met him unexpectedly in Aizawl about nine days before the seizure while she was there for a medical check-up, she said. She said he gave her Rs 1,000 to help her with her bills, and asked that she do a simple favour in return; some of his wares were coming by Sumo Service from Shillong to Aizawl on June 9, he said, and asked if she could load them unto the Farkawn bus for him. She obliged, she said, and left for Kawlkulh the following day. The day after that, the cargo was seized at Farkawn. Officials are not ruling out the possibility that the 216 kgs (or 183.5 kgs, as it turned out later) of pangolin scales seized at Farkawn are part of the 292 kgs that was replaced with fakes at the forest department godown at Kolasib less than three weeks earlier.